We’re not talking Harley Davidson here. But bicycles. 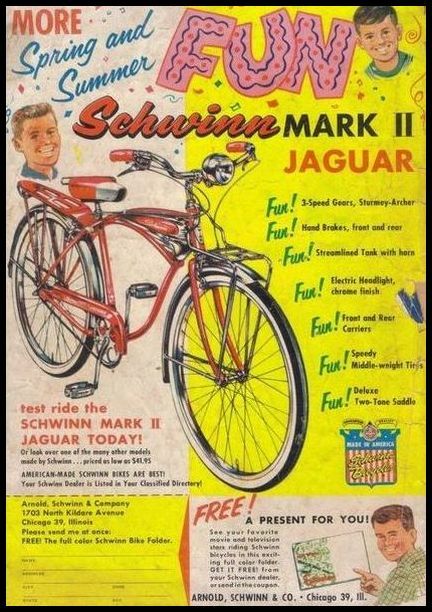 And Schwinn in particular. Since my country of origin (Holland) is the Nr. 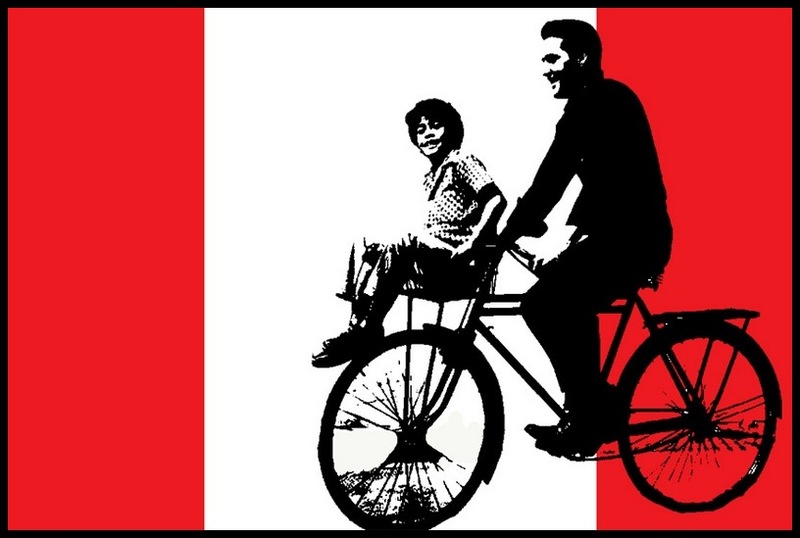 1 bike-riding country in the world, I just had to do an article about the connection between Elvis and bicycles. 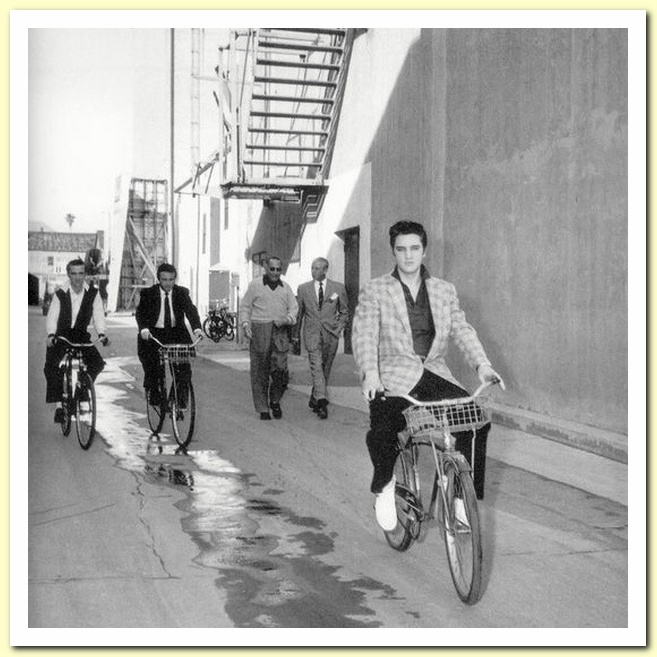 The focus is on the 50’s of course, and I have tried to collect all known images of ‘Elvis + bike’ in one place. So, hit the saddle and take a ride! 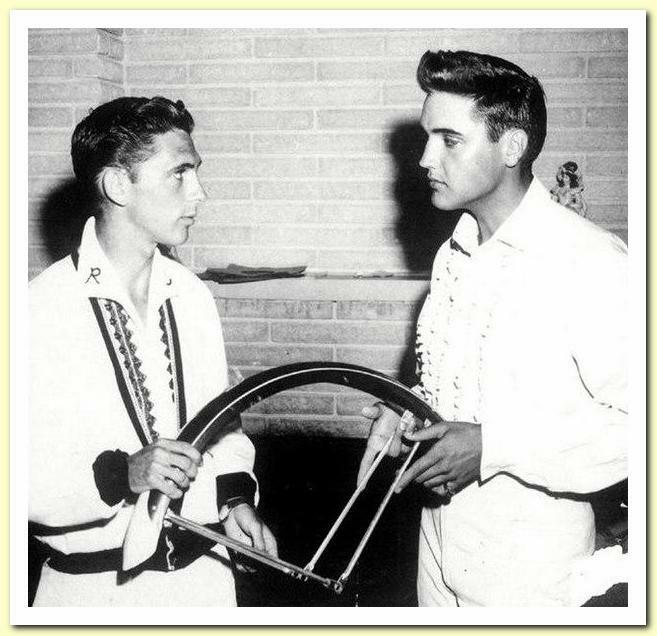 According to legend, Elvis wanted either a rifle or a bicycle for his 11th birthday (in January 1946), but he got a guitar instead and the rest is history. 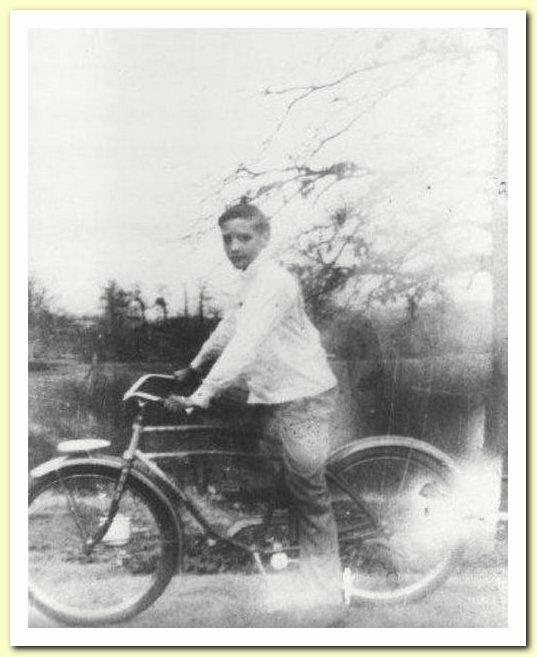 Yet, here we see him in a proud pose with a bike around the time he must have been 10 or 11 years old. His toes barely reach the ground, and the bike was surely meant to ride him through his first years of teenage-hood. 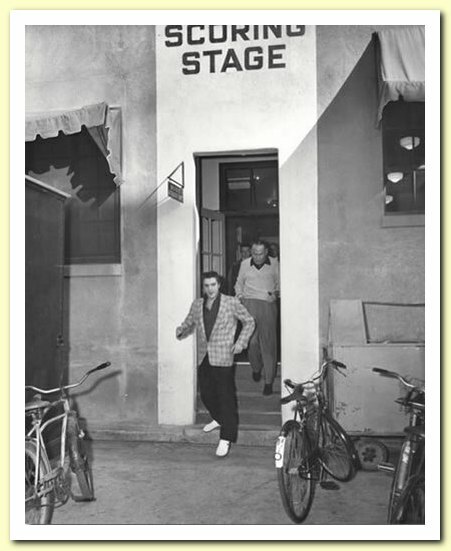 In the summer of that same year (1945) the Presley’s moved to Berry Street in East Tupelo. 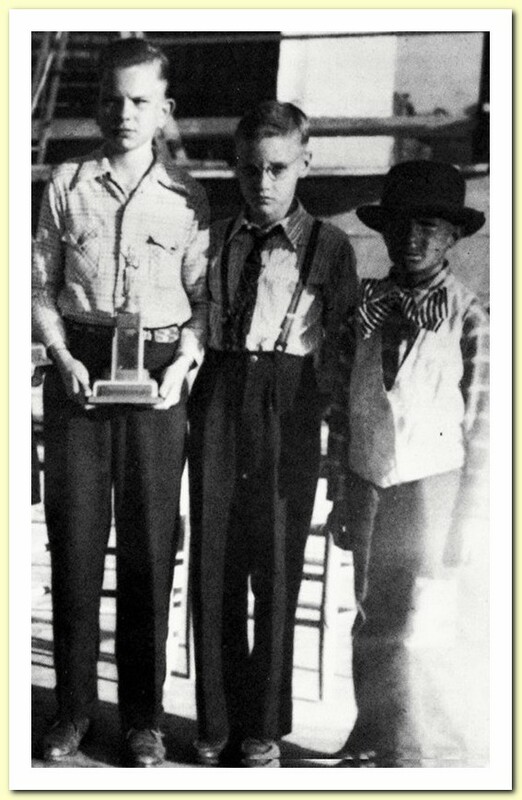 And in October Elvis sang Old Shep at the Mississippi-Alabama Fair & Dairy Show. Here we have the famous photo that was discovered last year. A lot of questions were raised concerning it’s authenticity. In the end most fans believed it was the real deal. I personally think it is indeed Elvis in this photo. 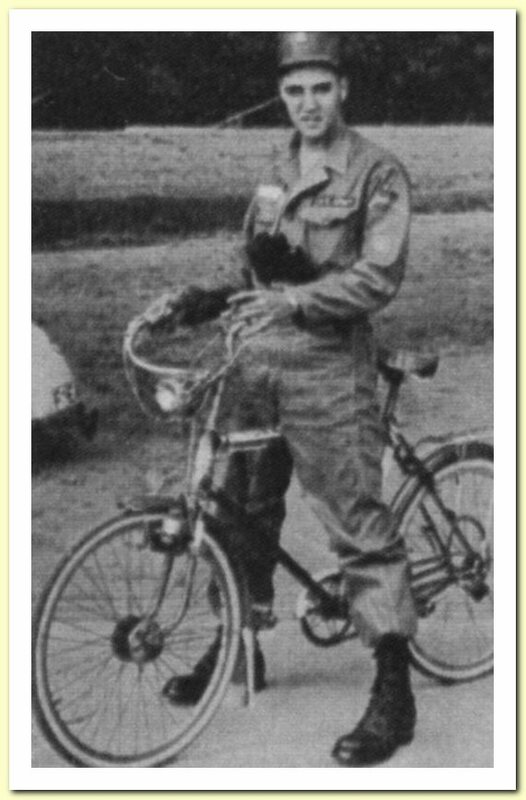 And the bike, I think, is the same as the one in the ’45 photo. Some parts are missing (like the headlight), but hey, not just Elvis has aged 3 years since the earlier picture, but so has the bike. 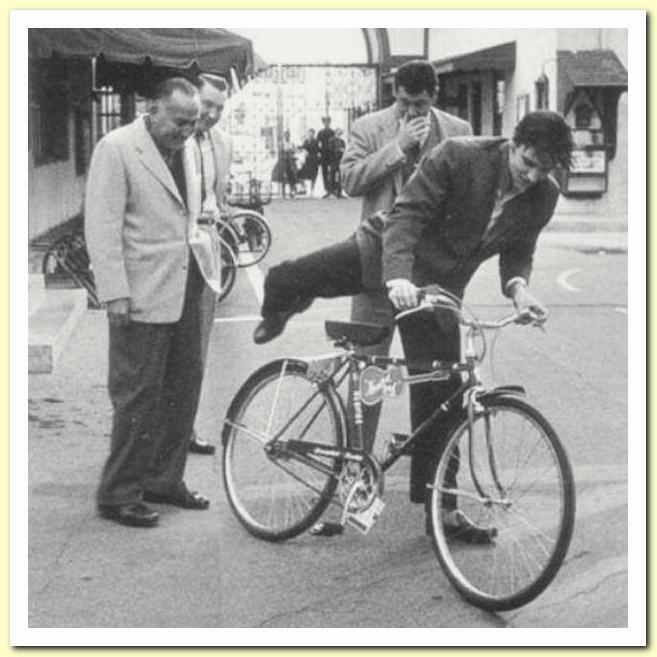 It was (and still is) very common for movie-employers to use a bicycle when moving around on the studio complex. 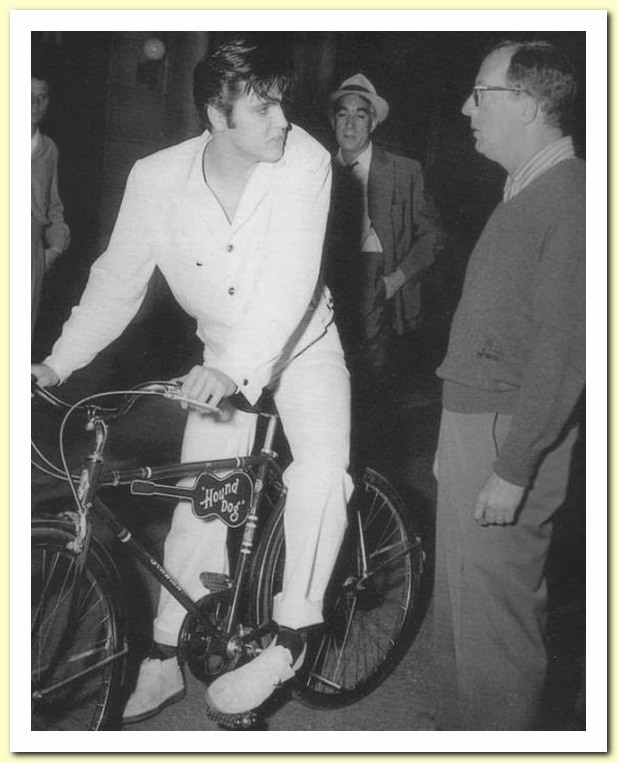 And quite often a star would be presented with a personalized bike. 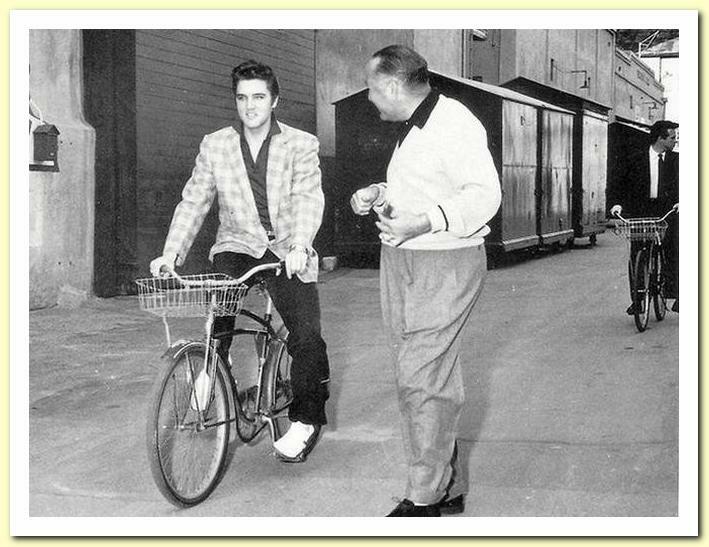 Elvis was given his very own steel horse when production for Loving You started in January of 1957 at Paramount Studios. 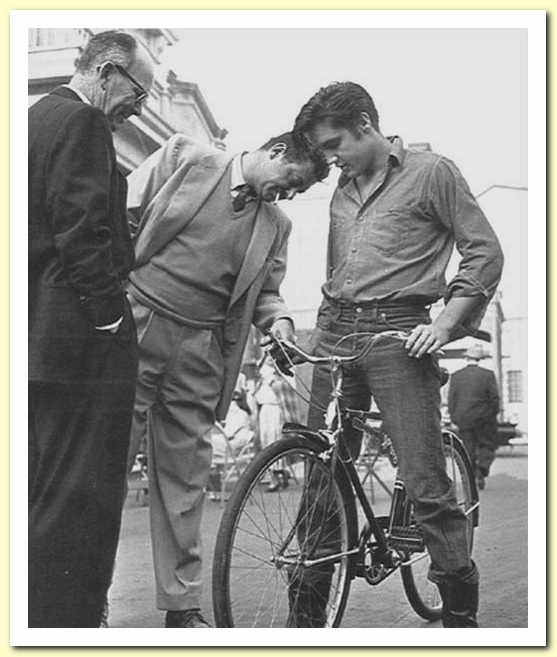 (photo below) Director of the movie, Hal Kanter, and producer Hal Wallis are looking on while a happy Elvis inspects his new Schwinn Racer: the famous Hound Dog bike. 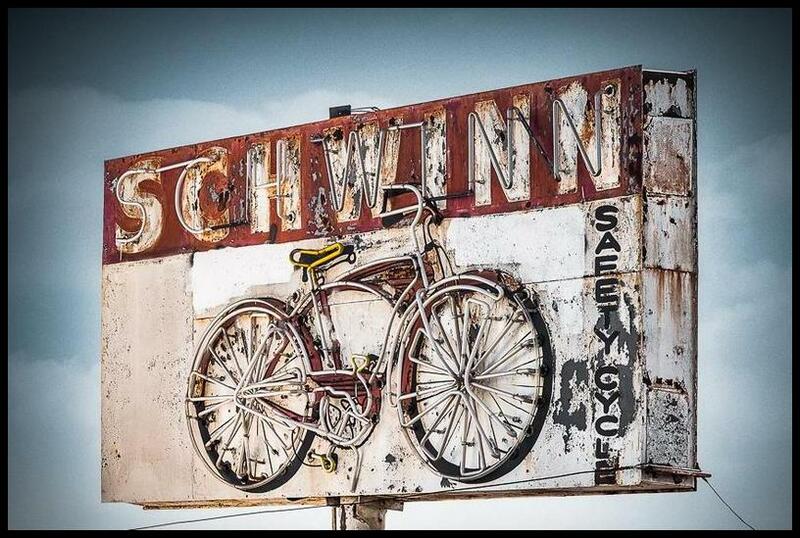 Woweee … a Schwinn Racer! 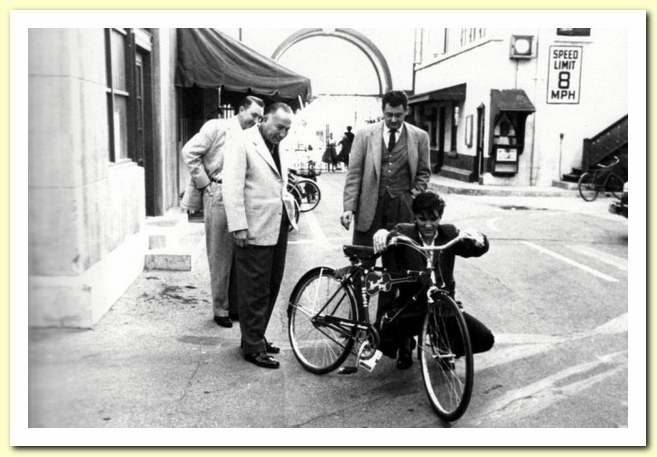 In most of the photos on Paramount’s backlot, we can see how small the Hound Dog bicycle actually is. The size of the frame suggests this bike was manufactured specifically for children. 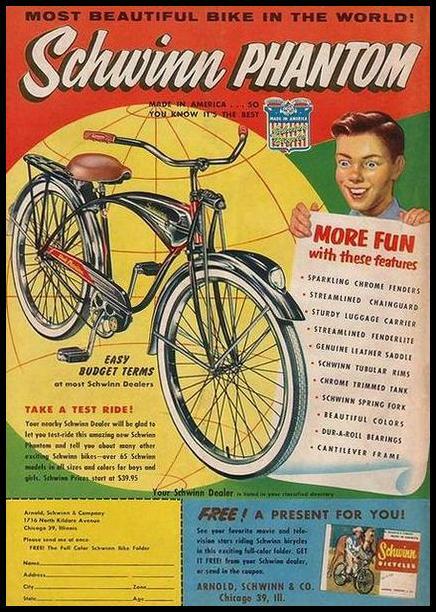 And in the ad (to the left) from 1956 for the Racer, we see that Schwinn’s target audience for this model were indeed young boys. 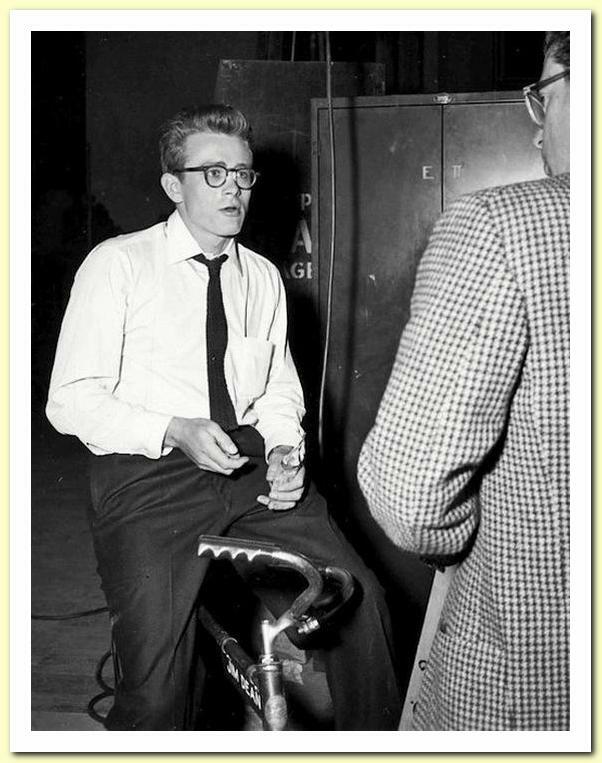 To the left we have James Dean on the set of Rebel Without A Cause, in 1955, and his personalized ‘Jim Dean’ bicycle. And to the right another Dean: Barney Dean was the writer of Son Of Paleface, starring Bob Hope. 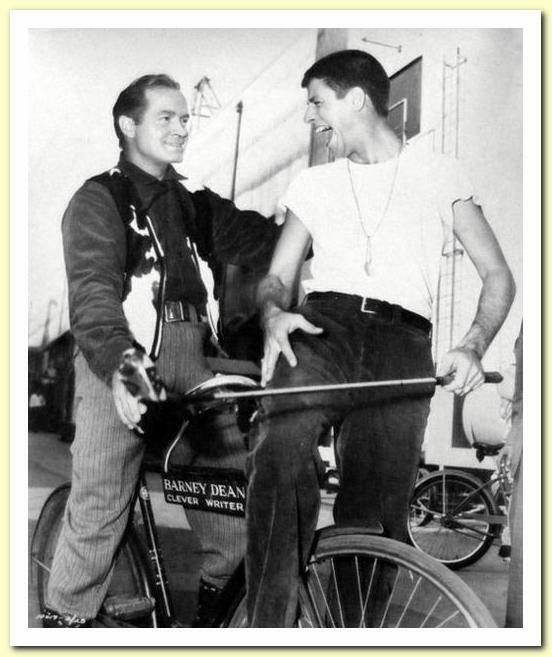 Jerry Lewis and Bob Hope met up while both were working at the same studio (on different movies) in 1952. Like Loving You, Paleface was a Paramount production. 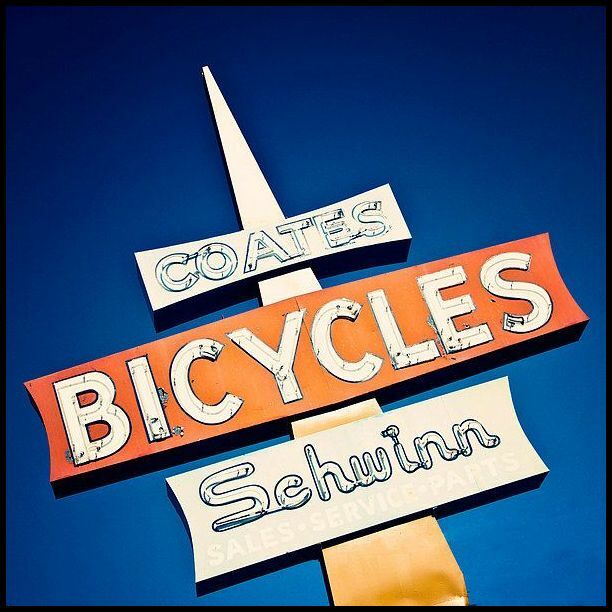 And the bike in this photo is also a Schwinn. In the photo to the right we can spot Gene Smith. 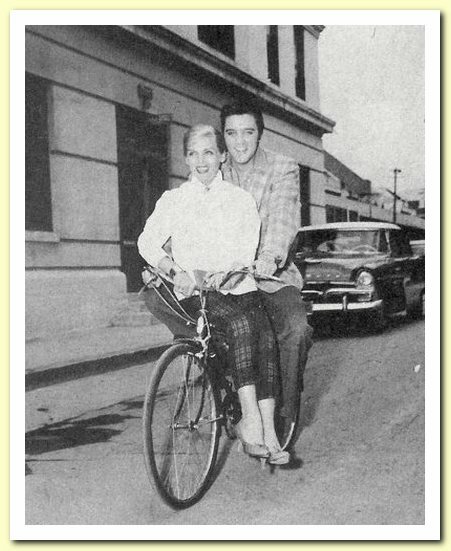 Elvis and Lizabeth Scott on a bike-tour around the studio complex. To the right we see a photo of James Stewart and (one of the most beautiful women in the world) Grace Kelly while filming Hitchcock’s Rear Window in 1954. It resembles the photo to the left of Elvis and Lizabeth Scott to a tee. 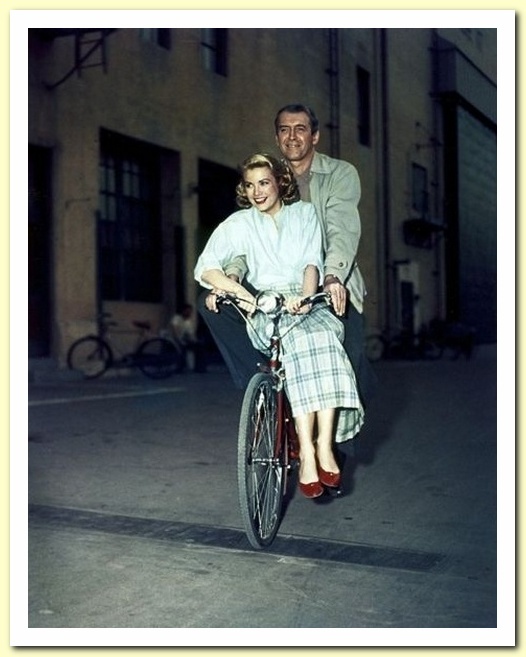 You guessed it: Rear Window was a Paramount production. These kind of ‘spontaneous’ photos were probably very common for the studio in order to publicize the chemistry between the main stars of a film. 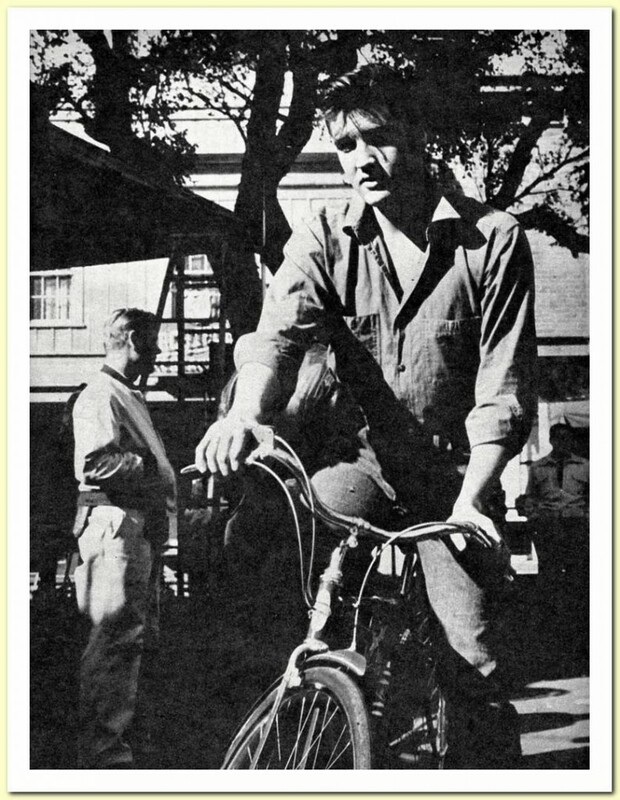 More bicycle-images on the set of Loving You, this time of Elvis wearing his denim outfit. On the image to the left we once again see Hal Kanter (taking a closer look at the gear system). The image below is a photo of a photo. 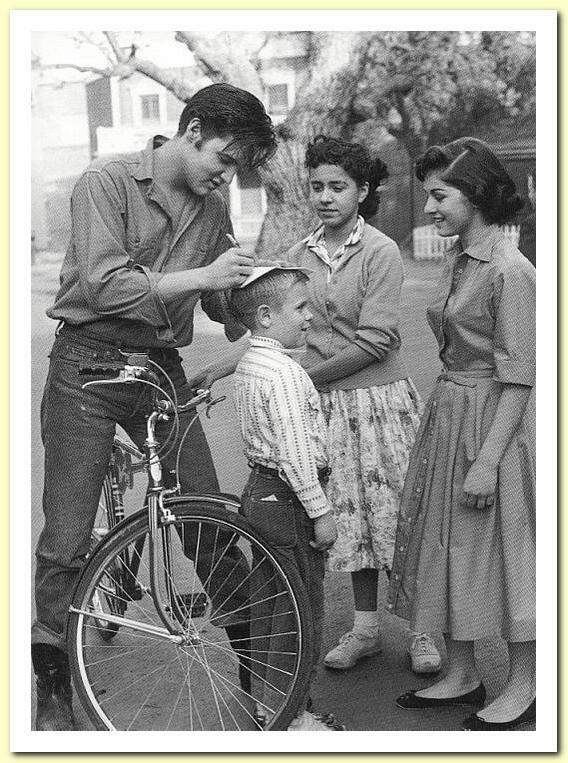 I always thought two different photos existed of Elvis signing a piece of paper on that boy’s head, but there are actually four. And going by how much time he takes to do that, Elvis probably wrote down all of Deke’s dialogue from the movie. Anyway, it would be really interesting if this paper would surface one day. That kid is wearing a very cool western-shirt by the way. 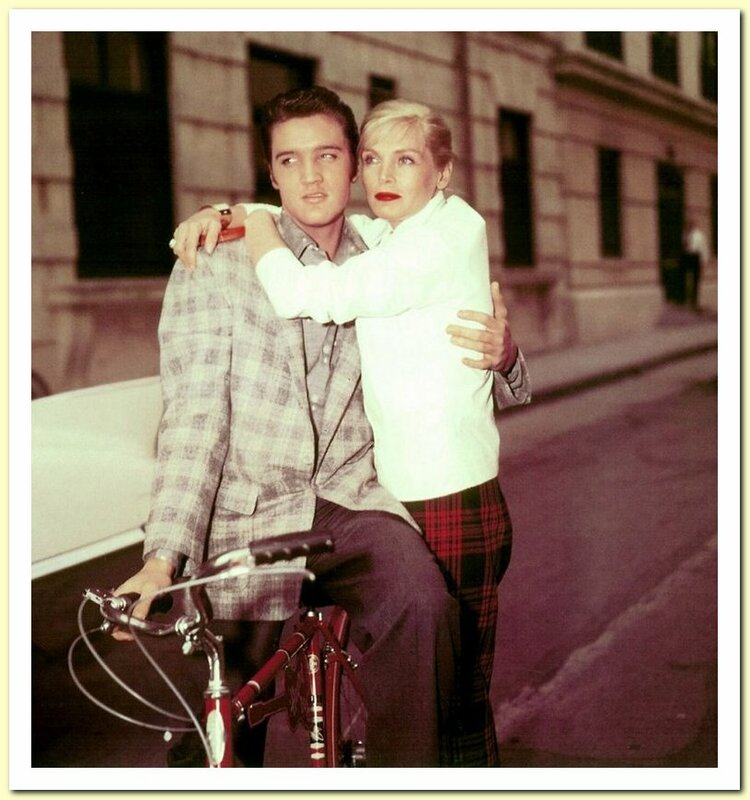 Elvis with actress Valerie Allen on the Paramount lot in February ’57. 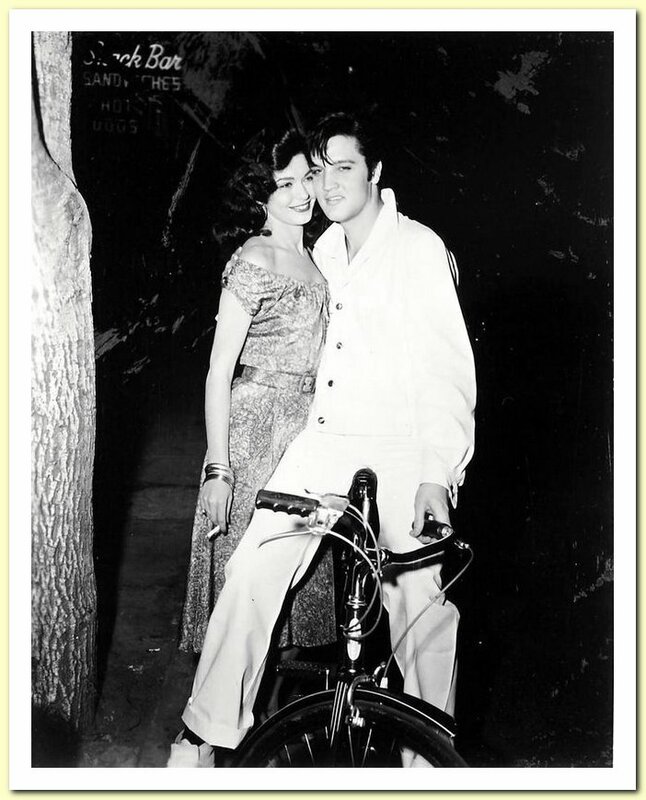 Valerie (under contract at Paramount) was also present at the Going Away Party, in March ’58, on the set of King Creole, just before Elvis was inducted into the army. Above we have a photo from the same evening. In the background we can spot Anthony Quinn (also a Paramount contractplayer). A year later: Different movie. Different girl. Same bike. 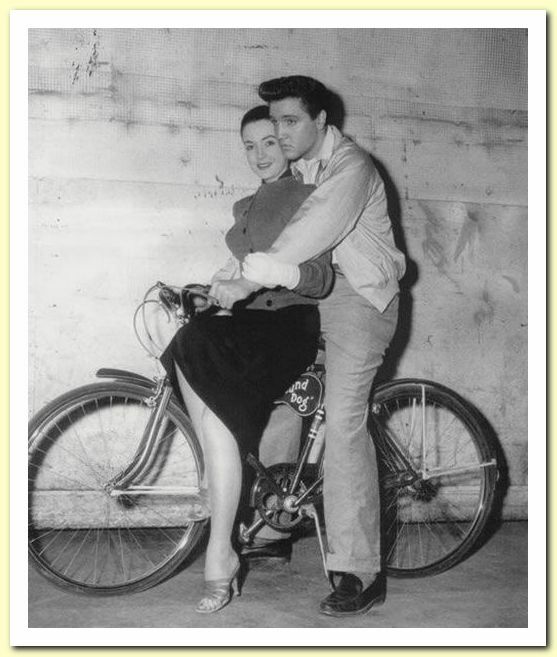 It makes perfect sense why Elvis stayed loyal to Hound Dog for so long: this bike was a babe-magnet! 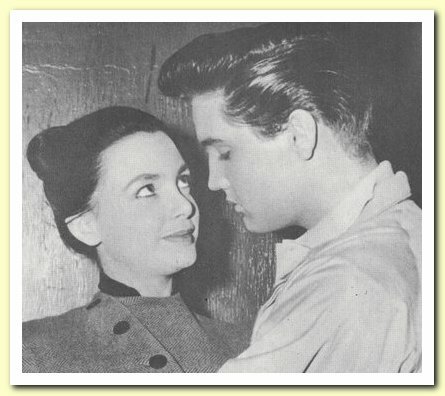 Elvis had met singer Kitty Dolan the previous year while touring in Las Vegas. He and Kitty dated for a while and kept in contact for another year. 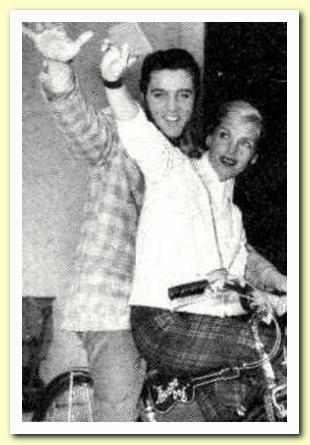 She visited Elvis on several occasions in 1958, like here on the set of King Creole. 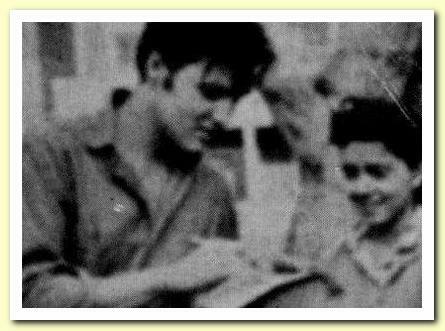 Kitty was also with Elvis around the time Gladys had died (when Elvis lived in Killeen, TX.). 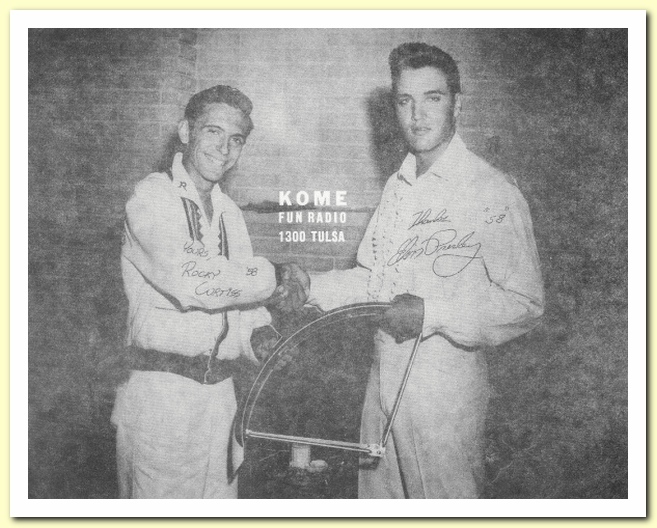 To promote the radio station he worked for (KOME from Tulsa, Oklahoma), ROCKY FRISCO decided to go on a 500 mile long bicycle trip to interview Elvis (who was in the army and living in Killeen, TX at that time). In a 1991 interview with Bill Burk, Rocky claimed he and Elvis ended up jamming together for 45 minutes. 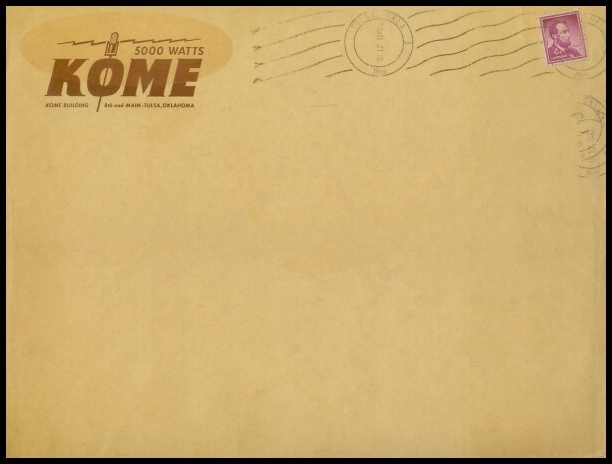 To the right the original envelope used by KOME to send out the publicity photo of Rocky with Elvis. And below we see the famous painting (hanging left of the stairs that are right in front of you when you enter Graceland) that was taken from the photo with Rocky. 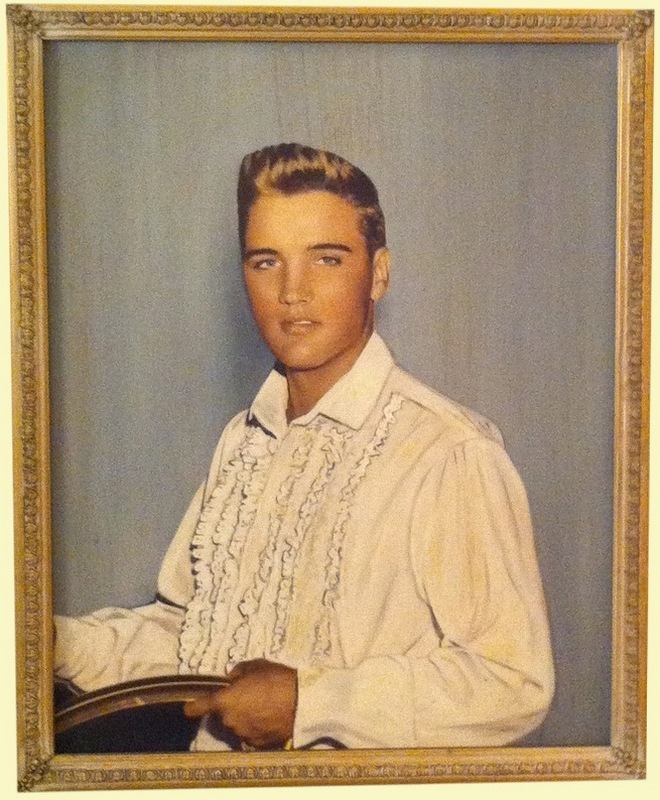 It is actually kind of weird to look at that painting knowing that half of the picture is missing and that Elvis is holding a bicycle fender (of all things!). The photo to the right is probably from 1958. And the image below is from 1959, Bad Nauheim. 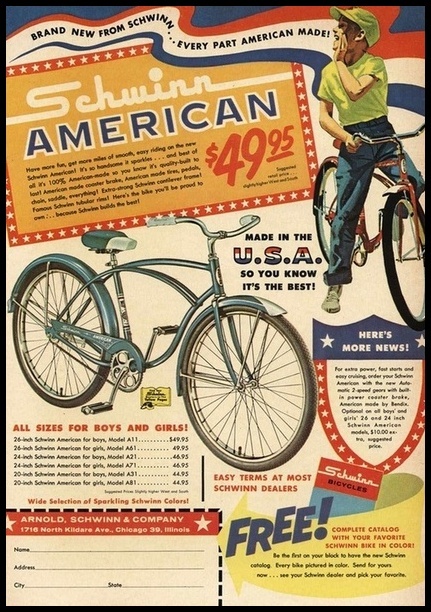 Some nice Schwinn ads from 1956 and ’57. 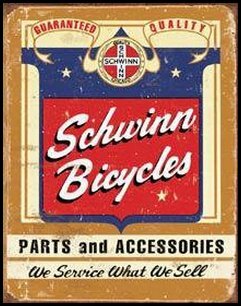 Schwinn promoted their bikes as “EVERY PART AMERICAN MADE!“, which appeared to be an important thing in the 50’s. 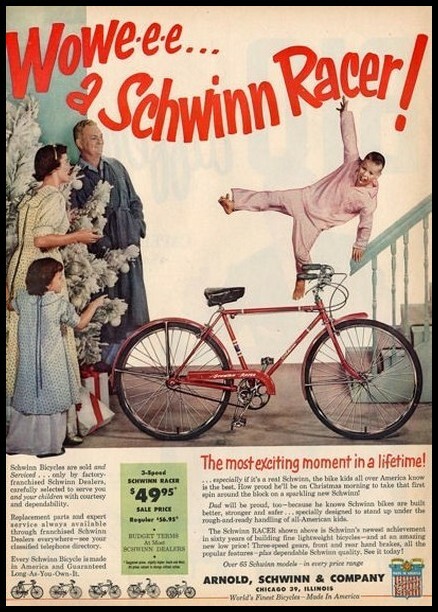 And as a “PRESENT FOR YOU!” the byer would receive a catalog advertising even more Schwinn bikes for free, wow! 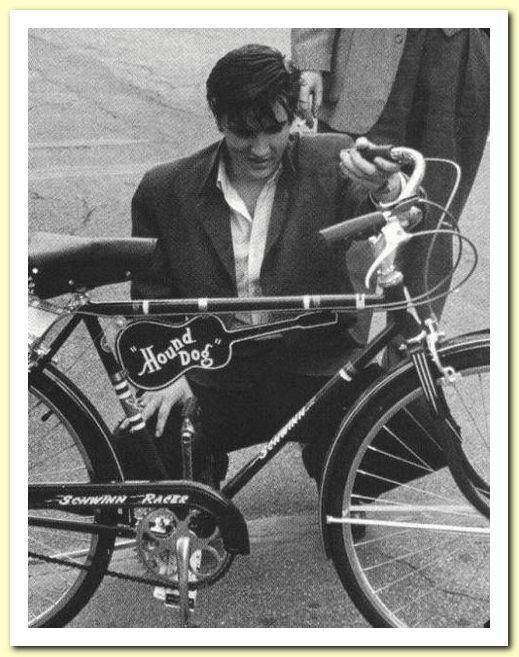 Since the photos of Elvis and his Hound Dog bike must have appeared in tons of magazines in the 50’s, one wonders why the Schwinn company did not offer him a commercial contract. A thought that immediatly comes to mind is “They probably did, but the Colonel turned them down”. I guess we’ll never know (for sure). 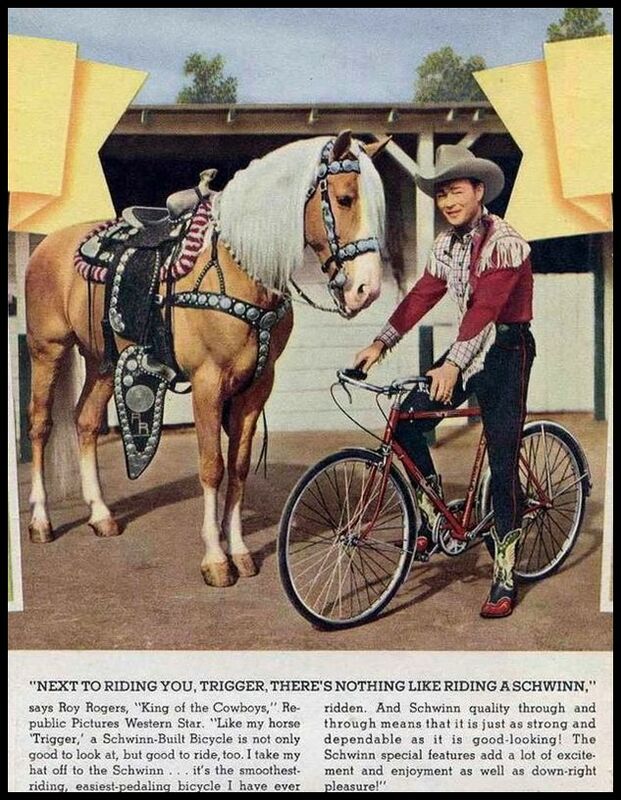 Some of the stars who did get involved with Schwinn were Ronald Reagan, Humphrey Bogart, Barbara Stanwyck, Bing Crosby, Bob Hope, Alan Ladd and Roy Rogers. 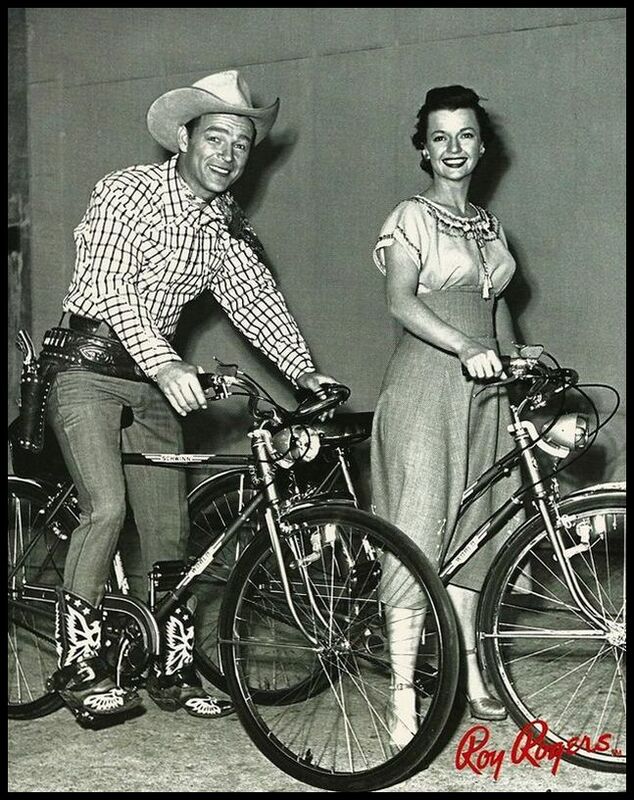 The big eye-catcher in the photo to the left (next to Roy’s amazing boots of course) is not the bike, but the lovely Dale Evans. Thanks for another interesting article on Elvis ! Most photos are new to me, and it’s very nice to see them so well presented along with the explanations, as always. 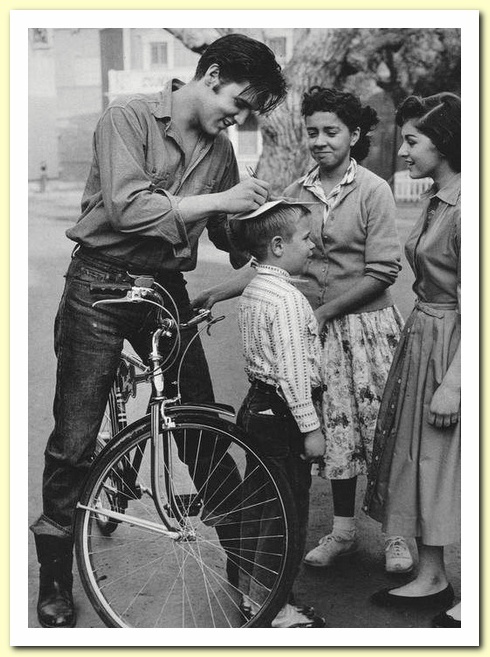 I also thought there were two photos of Elvis signing on the boy’s head. Now I know there are four ! 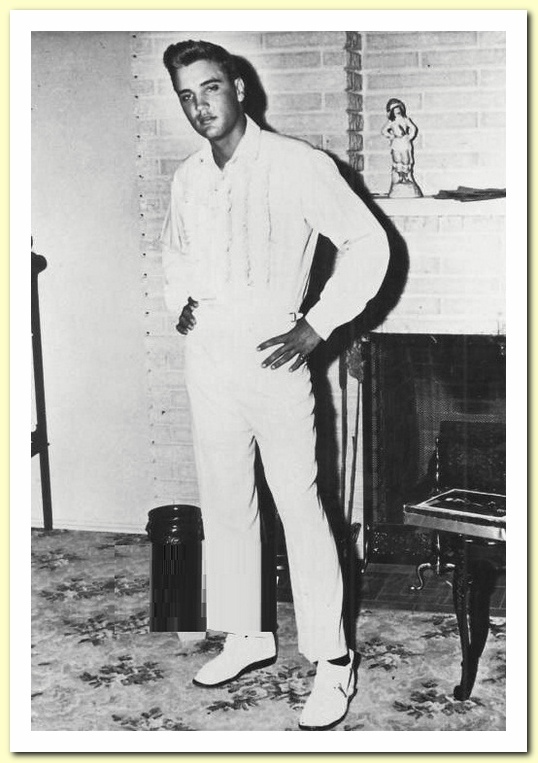 And I had never seen the uncropped “Graceland” photo with Rocky Frisco. I haven’t seen some of the pictures you posted. Never saw some of these photos. Thanks! 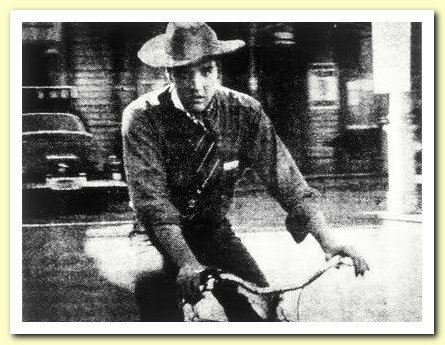 The new picture of Elvis and the bike could be Elvis, but it is not Tupelo, Mississippi. 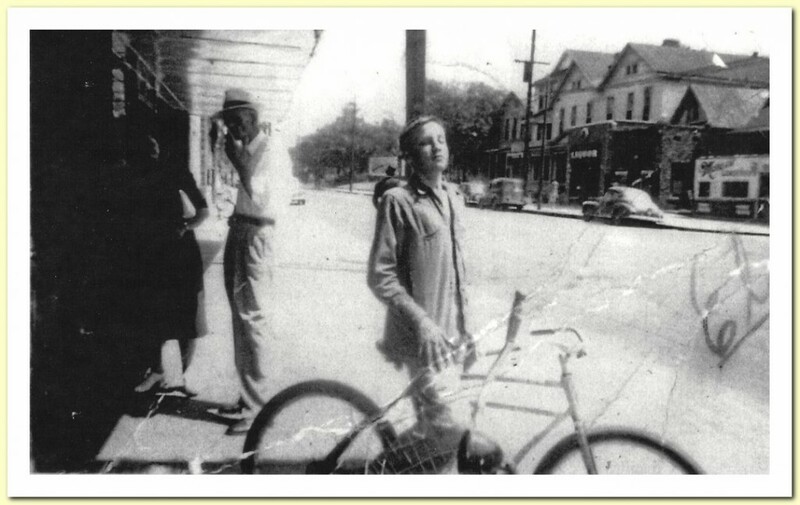 I have the largest collection of early Tupelo and Lee County pictures of anyone in the world. 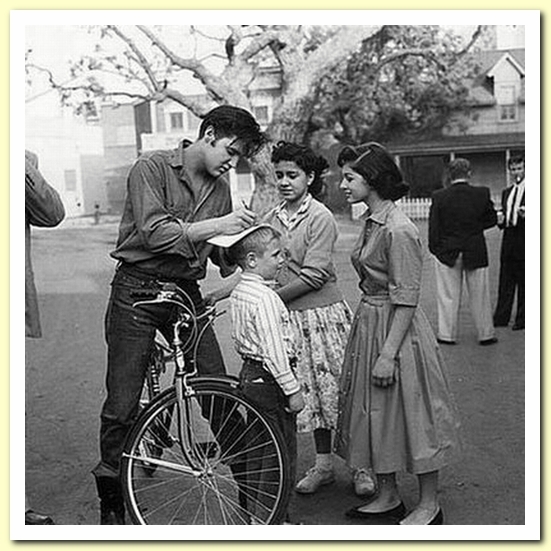 I have pictures of that location in Tupelo and that is not Tupelo. Julian, how sure are you? I’m questioning this photo as well. The magazine ads are the icing on the cake! Enjoyed it a lot! Great! 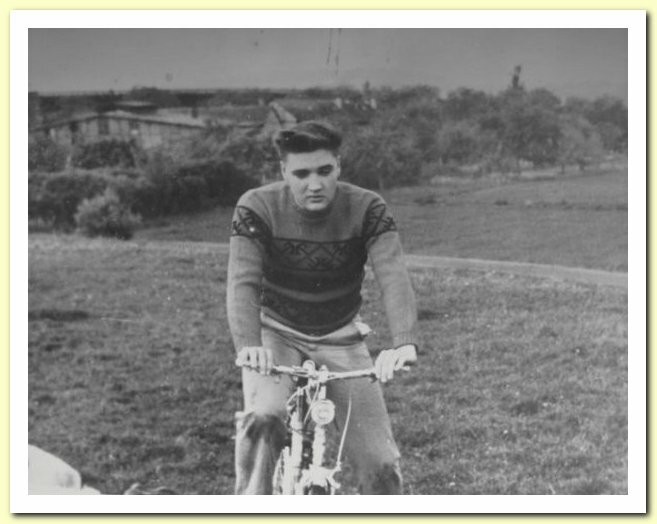 I love the picture of Elvis in Bad Nauheim. Have never seen that one before. The photo of Elvis and Rocky Curtis is in black and white, how did the color on just Elvis come to be? Is it a painting, or have they colored the photo? Didn’t know they could do that back then. And what year was this, cause if in 1958 his hair was black while in Jailhouse Rock, how is this photo made to look like his hair is blonde/lighter? Well, Kim, I don’t know the answer to your question, but in the black and white picture of Elvis and Rocky, it looks like bricks are behind them to me. On the colored picture of Elvis on the left, taken from it, there appears to be perhaps a curtain behind Elvis, not the bricks. Reading closer, Kim, it does say the colored picture of Elvis is the famous painting. This article was so well-done and informative. I truly love seeing these “new” photos. I don’t want to even blink my eyes as I study them and stare at that wonderful face. Thank you very much for making my day happy.